A young boy was found dead in Noida. The family and the people alleged that it is the Africans who have drugged him so he got cardiac arrest and after that the crowd swell and become violent against them. Police as usual arrest some of the Nigerian students and found nothing incriminating against them so release them later but the people are dissatisfied. The shocking part of this violence is a rumour when the boy was missing his mother felt that these Negros must have eaten him up. Earlier too some dogs were missing from the area. Now, in an area which could not trace the likes of Mohinder Singh Pandher and his associate for what they had been doing for years, accused of kidnapping children and eating them up. They are in jail but we do not hear any sensitivity on the issue. It is very easy to make any stereotype against African. Police swung into action, found the boys dead body but still the people continue to protest. Now, they twist the story that the boy was drugged. Yes, drugs are a big problems but are these problems created by the Africans here. Our children are too ‘naive’. Indians have not even learnt how to grow their children. They think except their children, everybody else is a crooked and here all those who do not look like them. A society which lives in false arrogance, where children are not taught that the world is diverse, that there are different languages, different colours of skins, diverse religions and regions, we will only grow in prejudices. After Yogi’s ascendency to power in Uttar Pradesh there is a tendency growing up among the powerful communities to take law unto their hand as they feel they have now got power and can do anything and get away with it. Already Muslims in the state are feeling enormous pressure in the name of closing of ‘slaughterhouses’ in the name of legal verses illegal debate. The state government knows fully well as who owned them and need to clarify it. Any slaughterhouse can become illegal if the government does not give it permission. Similarly, issue of threatening the opponents. The language is becoming shriller and arrogant day by day. The Noida incident is not isolated one and a sudden eruption of such feelings. These feeling will grow as we educate our children about our own ‘greatness’ and the masculine power of our civilisation. It is not that one should not respect ones values but there are certain values which are universal. Civilisations have grown when they have capacity to include various other ingredients that are brought by diverse ethnicities and other civilisation. No civilisation grow out of an isolation and without any amalgamation of various value systems. India’s strength was its diversity and strength to absorb but all this is under the attack. Nobody is better than us. If we appreciate others, it is ‘appeasement’. If we critique our own racial and caste based prejudices then we are ‘western liberal’ ignoring the wider fact that right from Buddha to Kabir to Ravidas, Ambedkar, Phule, Periyar, Rahul Sankrityayan, Vivekananda have spoken about the dirty of untouchability and caste discrimination in our society. Those who glorify our past have rarely done anything to do away with the caste discrimination. Africans have been our friends and have historical ties with us. In their war against colonialism, they learnt a lot from us and vice versa. Even when we have caste discrimination and our biases our political leadership always stood with the rights of Africans but today it is under severe strain. The biases in our minds exists even those who live in East Africa, Uganda or Kenya. Africans in these countries have reported how they face prejudices from Indians. The ideas which are being propagated and imposed upon Indian people are dangerous at the moment. The ideas of supremacy over others, of singularity, of so called oneness, which talks as if we are a homogeneous society rather than celebrating diversity of faiths, of regions, cultural values and races. It is becoming a society based on We and us which is not keen to accommodate ‘them’. The multiculturalism is a strength too but these days it has become the biggest whipping ground for the religious rights for whom every ailment of their society is because of ‘others’ who don’t follow their ‘faith” and ‘cultural value system”. Hence, you will find people who get suspicious of those who are non-vegetarian. There are people who look upon you as a criminal if you tell them that you eat meat or drink Vodka. If you are sitting late night, have a dancing group in which girls are partners, then immediately you are corrupt and the girls as ‘cheap’ and worst than ‘bigadail’. We know well whether it is Africans or North Eastern regions of Indian friends, they face these prejudices. They are looked as all of them are druggists. As if all of them are potential ‘rapists’ and as if all of the girls who smile and go around with their friends are ‘prostitutes’. Such mindset need to go. India will stand to lose in the comity of nations if we do not educate our children and families look insidiously as what ails our society. 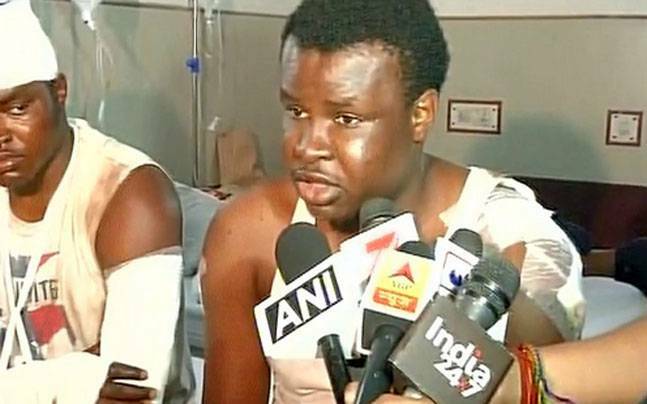 Are African nationals in India responsible for crime happening here? Are they responsible for drugs or bad habits of our children? Are African girls responsible for brothels that are operating here from centuries? We must think. We must not allow such farcical heroics to grow. It is time. If any African boy or girl are on the wrong side of the law, let it take its own course. The people have no right to decide on the street. You can not become a lynch mob and decide about it. International community is watching you and your behaviour pattern. It is time to grow. More than the people, it is the politicians who use people’s sentiments to grow in politics need to understand and behave as responsible spokesperson of the country. Indians face violence on such basis many places and we cry loud. Why do we engage in such things. Our administration and police need to be educated to handle such issues. At the top level, I would love to hear a Man ki Baat on the issue of untouchability, caste discrimination, racial and religious prejudices in our society. It remain the biggest challenge to India today whether we can rise above all these prejudices ? I am deeply saddened at the prejudice and discrimination directed to Africans in some parts of India. This is Xenophobia (hatred of foreigners). There is no excuse for it whether it takes place in South Africa, India, the USA, the UK or elsewhere in Europe. Perhaps a timely reminder to Indians (and all people) that if you want to check your DNA for your ancestry, you will find that ALL of humanity can be traced back to a single AFRICAN Eve. With Nelson Mandela, Steve Biko, Ahmed Kathrada and thousands of others, we have fought for an end to racism and the recognition of the ONENESS of humanity. I appeal to the people of India to remember the great struggles we fought for the freedom of S Africa and Indian. These were for an end to racism, sexism and for democracy. It is sad that prejudices are manufactured and spread to destabilize the working class people. These prejudices would justify the ill-treatment they receive based on caste prejudices. If these prejudices affect the ruling class the entire administration would swing into action. So it is in the interests of ordinary and hardworking people NOT to believe, disseminate, nurture and act on these unfounded, irrational and mutually reinforcing hatred and prejudices.